The Rev. 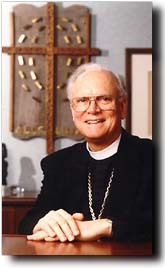 Dr. H. George Anderson served as the second Presiding Bishop of the Evangelical Lutheran Church in America, a denomination formed in 1988 through the merger of the American Lutheran Church, the Lutheran Church in America and the Association of Evangelical Lutheran Churches. He earned his B.D., qualifying him for ordination, in 1956, and earned his S.T.M. (Master of Sacred Theology), an advanced level degree, in 1958. 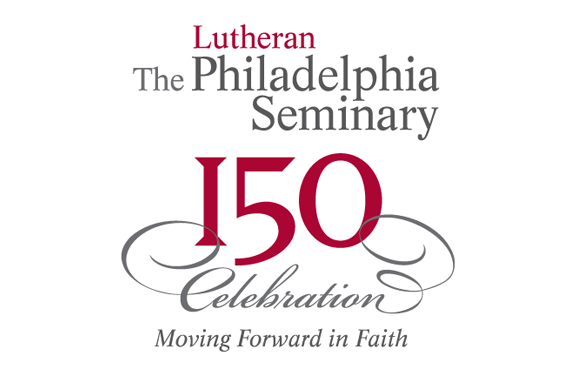 He served as a Fellow at LTSP (1956-58) while working toward a Master’s Degree at the University of Pennsylvania. He earned a PhD. in 1962. A native of Los Angeles, Anderson graduated Phi Beta Kappa from Yale University (1953). Anderson became widely known as an author and translator of works on Lutheran history. 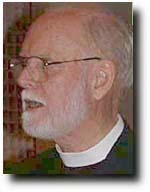 He served many years on the faculty of Lutheran Theological Southern Seminary, Columbia, SC, and was President of the school from 1970 to 1982. In 1982 he began 14 years of service as President of Luther College in Decorah, IA., and held that post at the time he was elected ELCA Presiding Bishop. In 1997, Anderson was named the seminary’s Distinguished Alumnus. Subsequently the H. George Anderson Chair for Mission and Cultures was established in his honor. The first recipient of the Chair was Dr. H.S. Wilson, former Professor of Mission and Cultures. Current Chair “occupant” is the Rev. Dr. Jayakiran Sebastian, Professor of Mission and Cultures and Dean of the Seminary, who was awarded the Chair April 23, 2013.